Whatever you need lifted, Ranger Products has a hydraulic power unit for the job. We take every measure to manufacture units that can be mounted to a variety of car lift types, from low-rise scissor lifts to larger two-post lifts and four-post lifts. The specs on this particular hydraulic power pack should really stand out and scream versatility. We made the tank size a little bigger at 13.6 L (3.6 gallons), so it can handle most lifting applications. The single-phase 2.5 HP motor runs quietly during each lift, even when servicing heavy vehicles. The 2,650 psi pressure relief valve is a work of engineering genius to keep you, your equipment and your vehicle safe from any instance of pressure build-up. We’ve essentially brought you the safest possible product, manufactured with a safety-first mentality and delivered to you UL / ETL Certified. 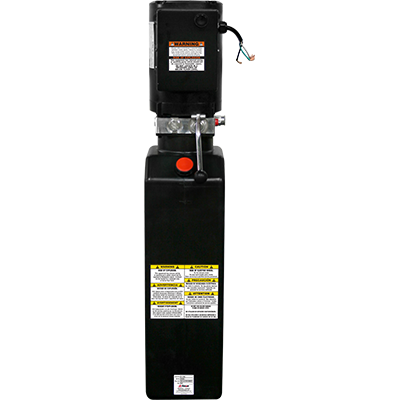 This particular unit saves electricity by harnessing the power of gravity to safely lower your vehicle, which extends the life of your hydraulic power unit while decreasing operating costs. The casing around the motor is secure and weatherproof, so you never have to worry about dust, dirt, air pollutant or other random debris disrupting car lift operations. Regardless of what time of year it is, Ranger power units have a safe operating range of (-25 – 79°​C), so they function in virtually every temperature you can throw at it. If you’re still not convinced that Ranger Products produces the safest, most durable and user-friendly hydraulic power units, we include a 12-month comprehensive warranty on all repairs, parts replacements and related freight charges. The best thing you can do if you have questions about our versatile hydraulic power packs is call us and share your specific lifting needs. Our experts will point you in the right direction.